Due to a wonky schedule, this is the first time in a month that my little Plush Club has met up. I’m really excited about the project that we are doing over the next two meetings. I got the patterns for the raccoon and mushroom from Better Homes and Gardens “Make it Yourself” magazine, the fall/winter edition. I changed up the raccoon pattern a bit, to allow it to stand on its own. I added the bits of grass and everything is glued onto the paper box from the craft store. 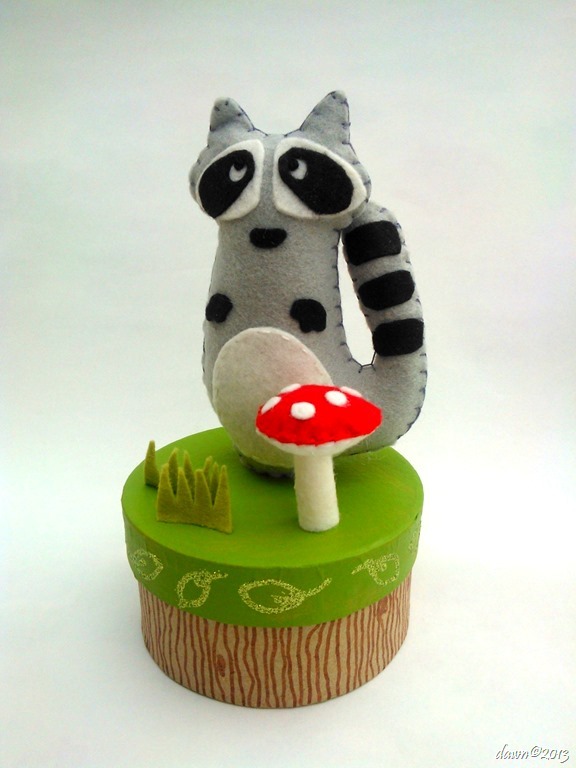 This week we’ll make the raccoon and next week we’ll make the mushroom and decorate the boxes. The magazine is loaded with projects and ideas – something that seems to be a rarity these days. If you are looking for Thanksgiving decorating ideas or ideas for homemade gifts, this issue is great.